Stormwater drains and infrastructure have come to life in Civic with colorful, provocative and creative artwork by local artists Benjamin Reeve and Delene White. The DrainART has been placed on stormwater drains that lead straight from Civic to Lake Burley Griffin and more will be rolled out across the ACT and region, including Cooma, Yass and Queanbeyan, over coming weeks. 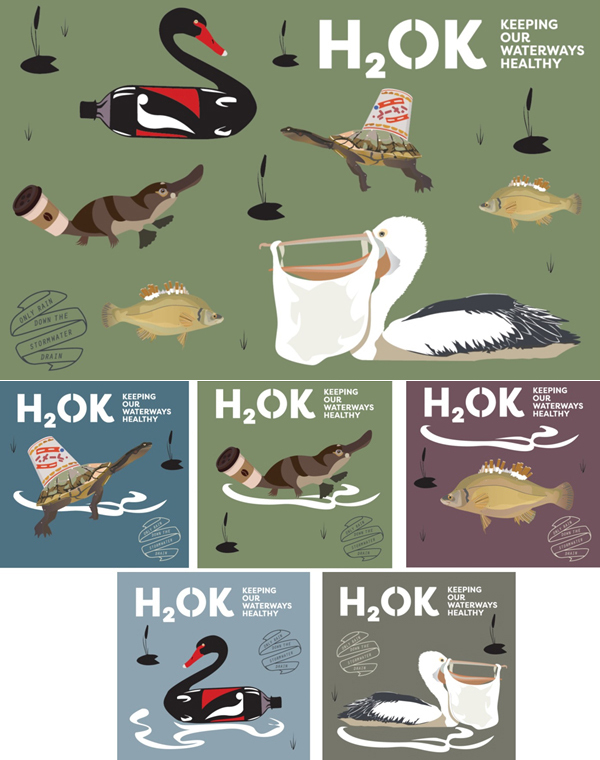 Look for decals and stencils that show how pollutants such as rubbish, cigarettes, oil, leaves and grass wash off the street into the stormwater drains and end up in our lakes and waterways. 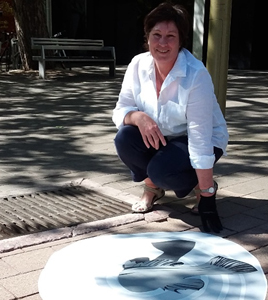 The ACT Government hopes the artwork will draw pedestrians' attention to the issue of water quality for our region and encourage us to change what we do in the streets and on our blocks at home. The DrainART project sends a clear, visual message that pollutants and rubbish on the city’s streets travel straight to Lake Burley Griffin and on to the Molonglo and Murrumbidgee rivers where poor water quality can affect local wildlife that live in and around the water. Benjamin Reeve is an artist and curator based in Canberra. His creative work can be found on an impressive list of projects and has featured in many Australian and international productions, from large scale graffiti murals to big budget films. Benjamin works full time as an artist and exhibition curator and is currently doing his Doctorate of Creative Industries. Benjamin is passionate about Canberra’s waterways and regularly enjoys walks around Lake Burley Griffin with his family. Benjamin’s message is that we all have a responsibility to ensure our rubbish is put in its place and not left to pollute our waterways. His artwork connects wildlife with the rubbish that finds its way from our streets into the Molonglo River and Lake Burley Griffin and then downstream onto the Murrumbidgee River. Delene was born in Canberra at the same time the Molonglo River was dammed to make Lake Burley Griffin (1965). She studied silver-smithing at the Canberra School of Art and, upon graduation, received a DAAD scholarship to continue her study in Germany for 12 months. Delene went on to study graphic design, followed by a graduate diploma in marketing and communication. Delene was employed for her artistry and award-winning design skills on national and international projects for 15 years, before starting her own art and design business. The message in Delene’s art speaks of the vital connection between our world and the watery world that lies beneath its surface. Using subtle humour she hopes fellow Canberrans will remember this and appreciate the importance of keeping our waterways free from pollution. Local students from upper primary schools (year 5 and 6) and high schools (year 7 to 12) from ACT, Cooma, Yass and Queanbeyan were invited to submit artwork that helps spread the message that only rain should go down our stormwater drains. A total of 53 students entered the design competition and 16 winning entries were chosen. 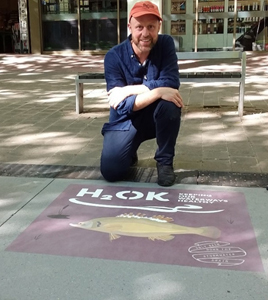 The winning designs have been printed on high quality stickers (also known as decals) for placement on pavement, and installed around or near stormwater drains at key locations across Canberra and in Queanbeyan. This includes high pedestrian areas in the City, Braddon, Tuggeranong, Gungahlin, Weston Creek and Belconnen. This is the second DrainART installation in the ACT following the successful installation of decals created by professional local artists Benjamin Reeve and Delene White in October 2017. Other DrainART projects will follow Cooma, Yass and Queanbeyan. Through colourful, creative and thought-provoking art, each winning design uniquely demonstrates the impact pollution has on our waterways. Their artwork not only helps reinforce the importance of ensuring only rain goes down the stormwater drain but also encourages students to become local champions for improving and protecting our waterways. The artwork also aims to raise awareness to the community about stormwater pollution that come from our streets (such as leaves, grass, rubbish, oils, soil and sediment etc.) and contribute to poor water quality and seasonal blue green algae blooms. The DrainART project is a component of the ACT and region H2OK: Keeping our waterways healthy stormwater education and behaviour change program, being delivered as part of the $93 million ACT Healthy Waterways Project funded by the Australian and ACT governments to improve the quality of water entering our lakes and waterways and flowing downstream into the Murrumbidgee River system.